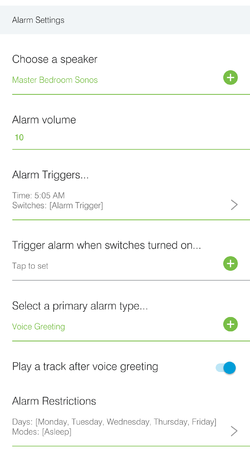 Talking Alarm Clock is a Smartapp for the SmartThings home automation system. Talking Alarm Clock allows for multiple alarm schedules to be set up to 'talk' through Sonos connected speakers, or play various sounds or music/internet radio stations. The instructions here are for the upgraded version, which is unpublished at this time. Sonos Speakers connected to your SmartThings account. At this time, Talking Alarm Clock only works with Sonos speakers; the SmartApp may not function with other speaker types. 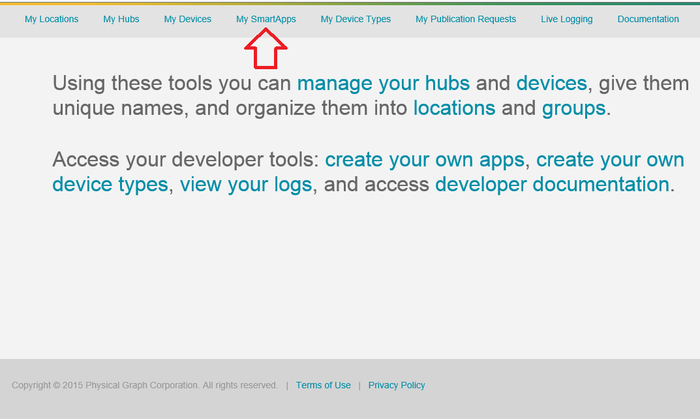 Optional: Devices (Switches, lighting, thermostats, etc) that are operational within the SmartThings environment. The alarm can trigger these items to activate. Optional: Presence sensors to determine voice greeting and when the alarm goes off. 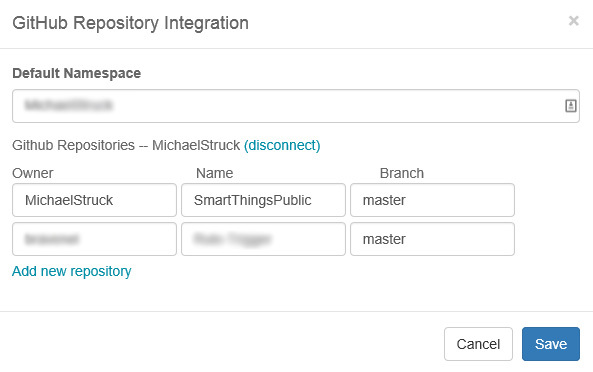 Parent/Child SmartApp: A code structure within the SmartThings development environment where a single instance of a parent SmartApp can have multiple child SmartApps associated with it, allowing the single SmartApp to have multiple functions. Talking Alarm Clock uses this structure; there can only be one instance of the Talking Alarm Clock Parent SmartApp and each scenario created within the parent SmartApp is actually an instance of the child SmartApp. This structure cuts down on repeated code within a single SmartApp. The setup of your Sonos Speakers is outside the scope of this document. 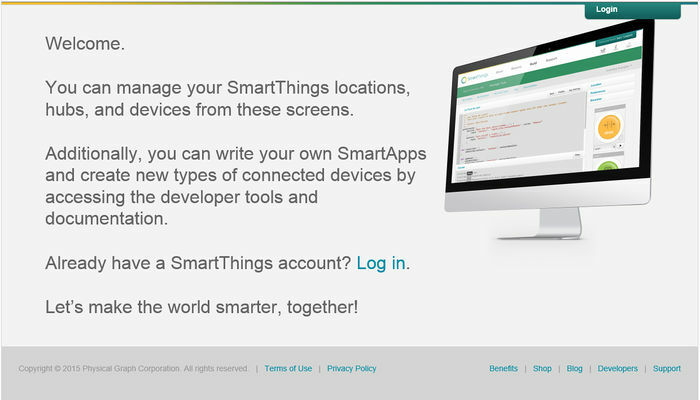 Please refer to the SmartThings documentation []. There are two components required for Talking Alarm Clock, the Parent and Child(schedule) SmartApps. 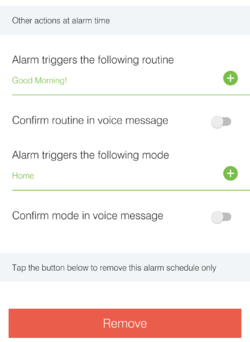 When you first open the SmartApp, you will be able to create a new alarm schedule. This will also be the location where you will see the name of each alarm that you have created. Start by tapping <<Create New Alarm Schedule>>. This will open the main configuration page to allow you to set up your alarm. The empty alarm settings page will have a minimal amount of detail on it until you begin entering your information. Start with the <<Alarm Schedule Name>> which is typically your reference for the alarm. Something like "Weekdays" will work. Please note that the name will be used in the Alarm Summaries. It should also be noted that ALL schedules created will be enabled by default. 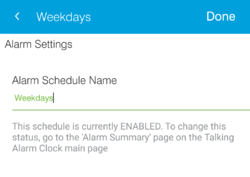 When you have completed the configuration of the alarm schedule, you will want to return to the main Talking Alarm Clock screen, enter the <<Alarm Summary>> page and ensure your alarms are enabled/disabled to your satisfaction. Next, in the <<Alarm Settings>> area, choose a connected speaker. Once you do this device, additional options will appear. After choosing the speaker, choose the volume the speaker will be at when the alarm is activated. No entry will leave the speaker the same volume it was when last played, which may not be desirable. Next, choose the triggers for the alarm. You can choose a specific time, the arrival of a person (and a delay after arrival), or if you have other automation that activates switches (physical or virtual), you may also trigger the alarm using the "on" of a set of switches. If any of these switches come on, the alarm will trigger. You may choose multiple triggers within the same scenario to trigger the alarm. From here, your next option is the <<Select a primary alarm type...>>. The Talking Alarm Clock has many options to allow you to start off with a wake up sound, a voice greeting, or music/internet radio station at alarm. This is considered the primary alarm. Depending on the selection, you may have the ability to choose a secondary alarm. For example, if you choose a voice greeting, you can then choose to play a track after the voice greeting. Or, if you choose an alarm sound (like a rooster), you can then choose a secondary alarm of music to play or instead, a voice greeting. The options on the page will change based on the selection you choose. Finally in this section, you can choose the restrictions to evaluate when the alarm time comes up. If the restrictions are set but don't match your criteria, then the alarm will not sound. This can be useful to set up an alarm you don't have to manage nightly if you follow a specific schedule (i.e. just weekdays the alarm goes off). When you open this page, you will have multiple options to restrict when the scheduled alarm is active. Please note that empty restrictions are considered "turned off" and will not be considered at alarm time. For example, if you do not list any days of the week as a restriction, it will trigger every day. This goes for the time, mode, presence sensors and on/off switches...no entries and these parameters will not be considered at alarm time. If you choose to set up restrictions, choose the days, times, modes, or presence sensors you want to utilize in the decision process at alarm time. Additional restriction options include having the alarm active when certain switches are on or off. This could be a physical switch (like a bathroom light) that, when on, indicates you are already up and that the alarm does not need to go off. You can also have the opposite occur; let's say you have a virtual on/off (simulated) switch that other automation controls that when it is off, it indicates you are asleep, and when on you are awake. If you choose to use presence sensors to determine whether the alarm goes off or not, once you choose the presence sensors to use, an addition option appears. Using this option, you can determine if ALL of the presence sensors need to be present to activate the alarm, or just one of the sensors in the list. The toggle being to the left (off) means any of the presence sensors can be present, the right (on) will require ALL of the presence sensors to be present to trip the alarm. In addition, the names of these sensor can be used with the %people% variable within the voice greeting (see Talking_Alarm_Clock#Voice_Greetings), so it is recommended you name the sensors the name of the people they represent. In this section, you can set up a verbal message when the alarm is triggered. In addition to the static message you can use, there are variables that can be used to personalize the message. %people% This will give a list of people that are at home at the time of the alarm. The names are defined in the Talking Alarm Clock#Presence Sensors area. More variables are being developed to further customize this area. If you have chosen a primary or secondary option of having music play, you will be presented with an option to choose a recently played track or internet radio station. If your primary alarm is a sound, you have the ability to choose a pre-defined sound, you choose a custom sound that you may know the URL of. You also have the option of defining how long that sound it played. 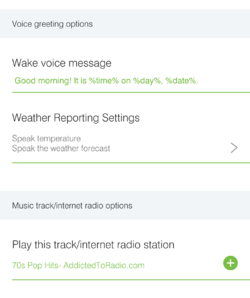 If you choose to have verbal reporting to wake you up, you have the option on adding a weather report to your greeting. 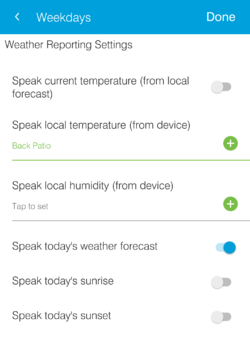 This will allow you to report the current temperature (local and from a local weather station), the local humidity (using a local device), give the weather forecast and speak the sunrise/sunset times. It should be noted that much of the information provided in the verbal reporting is obtained based on your SmartThings location, or the zip code you enter at the bottom of this screen. If you find the weather report is inaccurate or does not produce the results you are looking for, attempt to change the zip code to determine if that makes a difference. In addition to verbal or audio alarms, you also have the option to perform other functions at alarm time. Switches, dimmers and thermostats can be turned on (or the level set with dimmers, and temperatures set) when the alarm goes off. If you have verbal alarms set, you can also confirm that these switches or thermostats were set. In addition to devices that can be controlled at alarm time, you can also set the mode or run a routine at alarm time. For example, maybe you have a routine called "Good morning". At alarm time, you can run this routine. In addition, if you have verbal messages turned on, you can have a message spoken at alarm time confirming which mode or routine is set. To remove the schedule, click the <<Remove>> button at the bottom of the screen. Please note that this ONLY removes the schedule you are currently viewing; to completely remove the entire Talking Alarm Clock application, go to the main page, <<About Talking Alarm Clock>> and find the <<Remove>> button at the bottom of the page. 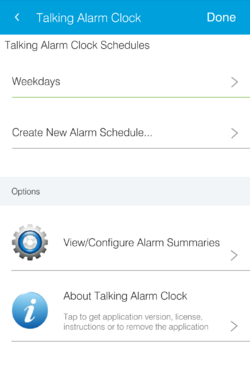 On the Talking Alarm Clock main menu, you will find a section labeled <<View/Configure Alarm Summaries>>. On this page you can get a summary of each alarm schedule that has been created, and easily enable/disable them without going into each individual schedule. 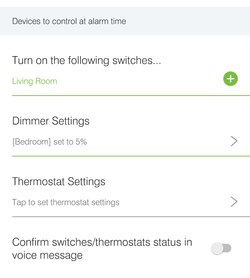 In addition, you can configure the SmartApp to give a verbal summary of the alarms (and their status) by pressing the SmartApp "play" button on the main screen or the change of a switch (physical or virtual) to "On"
To allow the activation of the verbal summary from the SmartThings SmartApp page, click the <<Enable voice summary from SmartApp page>>. This will reveal the settings to receive your summary, including the speaker to use, the volume, whether to include disabled alarms in the summary, and what modes to allow the summary to play. When you are done with these settings, click <<Done>> in the upper-right corner of the page. When on the main SmartApps page, you should now see a small "play" button on the Talking Alarm Clock SmartApp icon. If you do not, you may not have chosen a valid speaker or have not turned on the <<Enable voice summary from SmartApp page>> switch. You may also turn on the <<Enable voice summary when switches turned on>> and have the same voice summary options appear. On additional option will appear to choose the switches you will monitor to play the summary. It is recommended to use a virtual switch and some other automation (such as Alexa Helper) to activate a momentary button tile to play the summary on demand. 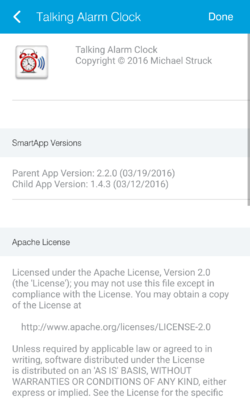 On this page you can view the version number of the parent and child (if installed) SmartApps, read the licensing agreement, a small set of instructions or remove the application/schedules. While there is no 'snooze' button, you can set up multiple alarm schedules to ensure you wake up. For example, one alarm may be set for 7:00am with just a rooster call, with the 7:10am alarm triggering a verbal weather report, and finally a 7:15am alarm with a song at a loud volume. Used with your mode settings, you can have a daily alarm that normally goes off when the house mode is "Asleep", but does not go off when the mode is "Asleep, sleep in". Using something like Alexa Helper or other automation, you can set the mode the night before to ensure the alarm goes off (or doesn't) based on this mode. 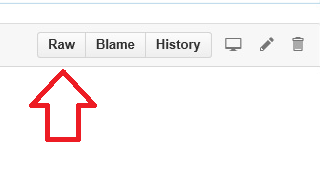 If an alarm fails to notify, be sure to check the <<Enable>> toggle on the <<Alarm Summary>> page. You may also look to determine if you meet the day, mode, and presence restrictions for the alarm to go off. If the voice announcements are working, but you don't get a weather report, you may want to enter your ZipCode within the <<Weather Reporting Settings>> page. This page was last edited on 21 April 2016, at 18:40.